First Store in Addy. Left to right: Addy blacksmith, 2 customers, George Seal, Jack Dudry, W. Anderson, antoher customer, (upper window) Irene Seal and Hattie Dudrey. 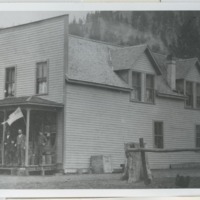 The store burned in 1920. “Addy blacksmith,” Crossroads Archive, accessed April 18, 2019, http://crossroadsarchive.net/items/show/25272.